Dirk was born in Leeuwarden, Holland, in 1504 as the son of a priest and (probably younger) brother of Obbe Philips. He was trained as a Franciscan monk and knew Latin, Greek and Hebrew. 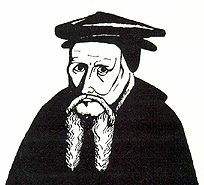 He joined the Anabaptists in 1533. He was baptized in Leeuwarden by Pieter Houtzager and ordained an elder soon after. Dirk became an influential leader and the leading theologian of the Anabaptists in Holland and northern Germany. From 1537 onwards Dirk took part in he most important meetings and conferences. Like Menno and Obbe he criticized the fanaticism of the Munsterites. Dirk wrote extensively about church discipline, the ban and order within the church. His emphasis on the ban and the purity of the community makes Philips' writings popular with the (Old Order) Amish. Philips' best known work is Enchiridion. He took stand against the fanaticism of the followers of Melchior Hoffman. Dirk Philips became the first bishop of the church in the city of Danzig, where a group of Dutch Mennonites had settled. Dirk died in 1568.